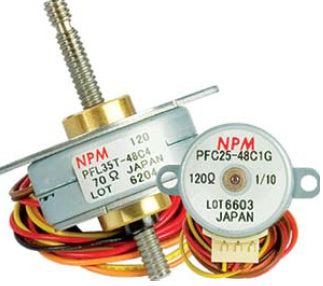 Nippon Pulse's linear stepper series provides a simple motion system at a fraction of the cost of conventional rotary stepper motors and traditional linear motion systems. Our LINEARSTEP® series are permanent magnet type stepper motors that enable linear motions without the need for external transformers. The LINEARSTEP® series offers a wide range of customizable options, including various screw pitches, screw lengths, bipolar or unipolar windings, and several operating voltages. Because of its ball bearing support and strong motor case, the LINEARSTEP® series provides you with durability and a long operating life. With an enhanced Neodymium rotor magnet, the LINEARSTEP® series also offers a large driving force, up to 39.5N at 200pps. These linear motors can be controlled and driven by the same electronics used for rotary stepper motors. LINEARSTEP® motors offer direct linear motion without any mechanical transformers and therefore allow you to design a simple system at a fraction of the cost of conventional rotary stepper motors. The PFL, PFCL series offers the design engineer the ultimate in flexibility to match the applications requirements.